As most readers are probably aware, there was an op-ed in the Saturday New York Times from Richard Muller announcing the Berkeley Earth team’s latest results. It was odd enough that a scientific paper was announced via an op-ed, rather than a press release, odder still that the paper was only being submitted and had not actually been accepted, and most odd of all was the framing – a ‘converted skeptic’ being convinced by his studies that the planet has indeed warmed and that human activity is the cause – which as Mike and Ken Caldiera pointed out has been known for almost 2 decades. Not wanting to be upstaged, plenty of ‘unconverted skeptics’ – including Anthony Watts and Ross McKitrick decided to stage dramatic press events and release barbs of their own. This was followed by a general piling on of commenters and bloggers trying to spin the events in their preferred direction combined with plenty of cluelessness in the general media about exactly who these people are (no-one special), what earth-shattering discovery had been made (none) and what it all means (not a lot). The ‘best’ response to this circus is to sit back and see how pretzel-like the logical justifications can become. I particularly like the recent twist to the “No true scotsman” post-hoc rationalisation. Since the ‘converted skeptic’/prodigal scientist meme is a very powerful framing for the media, the obvious riposte for the ‘skeptics’ is to declare that Muller was not a true skeptic. But since these terms have become meaningless in terms of any specific position, this ends up as a semantic argument that convinces no-one but the faithful. The actual trigger for all this hoopla is the deadline for papers that can be cited in the Second Order Draft of the new IPCC report. They needed to have been submitted to a journal by Tuesday (31 July) to qualify. Of course, they also need to be interesting, relevant and known to the IPCC lead authors. But there seems to be far too much emphasis being put on this deadline. The AR5 report is pretty much 90% written, and the broad outlines have been known for ages. Very few of the papers that have been submitted this week are anything other than minor steps forward and only a small number will be accorded anything other than a brief mention in AR5, and most not even that. Furthermore, once the SOD is finalised (Aug 10), Tuesday’s deadline becomes moot, and the only thing that matters for the final report is whether papers are accepted by March 2013. (In a spirit of full disclosure, I should mention that I was working on a couple of papers with an eye to making this deadline, but in the end decided it was preferable to take the time to do a good job on the papers than to submit something shoddy). The only worthwhile substance to any of this is the work that has mostly been done by Robert Rohde on the Berkeley Earth code and database as we’ve noted previously – and once this week’s drama has faded into the distance overshadowed by some new blog-storm, this work will still be a useful advance. But still the games go on. Senate hearings are one of the longest running games of political theatre going – where the Senators pretend to listen to the panelists and the panelists pretend that this is an efficient way to inform policymakers. This week’s was little different from the ones in the past – some earnest submissions from the mainstream, and a cherry-pickers delight of misinformation from the Republican invitee, John Christy, who even quoted the woefully inept first draft of the Watts paper as if it meant something. The TOB effect could result in a confirmation of the Watts et al conclusion, or a confirmation (from a skeptical source) that siting quality does not matter. In either case, this is still a game changing study. My inclination is just to sit back and watch the spectacle, admire the logic-defying leaps, marvel at the super-human feats of hubris and, in two weeks time, remark on how little actually changed. A good critique mentioning many problems of the “inept first draft” of the Watts paper can be found at Skeptical Science. Hansen reminds us that planetary scale physical processes are not deterred by clown shows. (More at Romm’s place, and Planet 3.0 nails the point.) But Mckibben shows us what it is really all about for the ruling one percent: 20 trillion dollars worth of carbon still unburned, but on the books and contributing to the value of stock portfolios – unless it has to be written off for the sake of the 99 percent. Hence this game is not played by Olympic rules, and may involve sudden death. With respect to Dr. Muller’s findings, “Been there, done that, wore out the t-shirt” pretty much sums it all up, I would think. I thought there was something interesting. A signature of GH warming is warmer nights…decreasing range. I asked about diurnal range at Tamino’s blog. The response I got (not from Tamino) was that it could be that aerosols had caused an overshooting of diurnal compression and that the range was returning to the long term trend. And just to add, I think the increasing diurnal range is probably due to increase in warming in the Northern hemisphere where there is more land rather than sea. Simple enough! Over at WUWT, I am one of the few that have cautioned against trumpeting this paper as the final nail. I do, however, think Watts has a point. Watts has stated he would like comments from all interested parties on his draft paper. This may not be traditional peer review, but there is a real opportunity for both sides of the debate to make a contribution. What if Watts point is valid? Would it be too much to ask for readers of RC to offer constructive criticism, which could either improve the paper or bury it? I find myself in full accord with Gavin’s final paragraph. A welcome distraction during what is (for us Brits) a pretty dismal summer. One possibly amusing outcome of this imbroglio will be if Watts actually did submit the paper somewhere given how McIntrye busily started rolling back taking any responsibility and the requirement that the corresponding author swear on a stack of bibles that all the co-authors are on board. It was a good week for popcorn. Well, it would be if there were two sides to the debate. As it is, there are simply those who undersand the science and those who don’t. Would you accept constructive criticism from SkepticalScience? In conclusion, Watts et al. of course deserve the right to try to make their case in the peer-reviewed literature, however implausible that case appears to be. Therefore, we hope they will consider addressing the important concerns detailed above before they submit the paper to a journal. Otherwise we suspect the paper will not fare well in the peer review process. With said caveats carefully addressed and the conclusions amended if and where necessary, the paper has the potential to be a useful contribution to the climate science literature. Some commenters on that article think that’s being too generous, because there’s a risk of lending Watts undeserved credibility. OTOH, “A soft answer turneth away wrath, but grievous words stir up anger.” For “framing” purposes, I’d go with the soft answer. MangoChutney: what exactly *is* the supposed point of the Watts paper? So far, it appears to those who work on this for a living that the point of the paper is “if you ignore all known corrections, required to correct for a variety of changes like time of observation and change of thermometer type, then the trend is not as high”. Which isn’t new, nor a valid point. It’s just blowing smoke. Re: Mr. MangoChutney writes (on the 5th of August, 2012 at 2:52 AM) an appeal for constructive criticism on a draft paper on station siting effects on US temperature observations. My position is as follows: The lead author has spent years misrepresenting climate science and vilifying climate scientists. Every word out of his mouth and every sentence he writes is designed to inflame his audience against an imagined conspiracy. I foresee that any criticism, praise, or comment, that I might, in more congenial circumstance, choose to voice would be distorted into the service of yet another jeremiad against climate science and scientists. I will not add grist to his mill. I do not work with those I do not trust, and I see no reason to do either here. What Mr. Watts has done, it seems to me, is put his paper out there in the hopes that others would comment and he could then use those comments to improve the paper. Constructive criticism there has been, in abundance. So, is he going to give due credit to all those who have offered substantive feedback? I wonder because the bottom line from the feedback seems to me to be that he has little more than bupkis, in the big scheme of things. The good folks at Skeptical Science are being appropriately generous in their final evaluation, as Mal Adapted points out. But I don’t see Watts as a genuine scholar in search of knowledge. I think the science community has been very generous and accommodating to him. An overall reaction to his work: meh. From where I sit, Watts’ work is a classic example of how not to do science: let ideology run the show. His reaction to Muller’s work is an example of that. And there are many more. For those of us who are statistically challenged, it would be most helpful if you could expand a bit on what is unique or valuable or both about Robert Rohde’s contribution. I’m a reasonably efficient Matlab coder and Rohde’s code is well commented but the overall logic or architecture is elusive. A does warming increase the intensity of teapot tempests? An embargo embroglio may be brewing. You say that you think Watts has a ‘point’ and ask “What if Watts point is valid?” I have a problem with what you say because I’m not entirely sure what this ‘point’ of Watts is that you talk of. Some clarification please. () A quote from Lemonick that perhaps implies a desire for “a much wider peer review” on the paper but nothing more is said.Who would be the intended peers? How they are to respond? () And the descriptor on the paper itself “PRE-PRINT DRAFT DISCUSSION PAPER” which pretty much means diddly-squat. You also say there is a real opportunity for both sides of the debate to make a contribution. Does Watts also say this or is it you suggesting it? I think if Watts truly wants contribution from folk here, he perhaps should make that fact known. Given the past experience of Watts, him being such a polite and courtious chap and all, I’m sure if he asked nicely he might just get a fitting reply from RealClimate & its patrons. Hard not to think Watts would’ve experienced a better week had he but emulated Schmidt over the prior weekend as per his plans. But who truly knows the future with human volition wiring the selector switch to puree, and, given the media environment seeking product placement in all the synapse gaps in the known universe, really too much about the present or past. I take “final nail” and “this paper” to mean conclusive evidence that human activity, principally CO2 atmospheric loading, is NOT a perturbation and will NOT have serious consequences. Must say … that observation on the “final nail” is rather perceptive. As to Watts having a point about crowd sourcing which is what I understand you to mean, this 3 minute clip rather neatly sums things up. It doesn’t seem to help. One criticism offerred, even by co-author McIntyre, is that TOBS adjustments are required. Here is his response. AW was enough pleased with it that he added it to his main post. So when it’s pointed out that TOBS adjustments are required, his response, based on some anecdotes, is that he doesn’t think observers would have adhered to the stated times, so the change can be ignored. Lemonick says: Huh? I’d better hustle over to WUWT, because I can’t recall saying something that could be quotable that way. Certainly not with reference to anything Muller has done lately..
Bro, you may be more tactful than some “over there”, however many others have pointed out the multiple problems with Mr. Watts’ analysis. “What if” needs more substantiation to be a contender. @Isotopious, @Sceptical Wombat: I wondered about that ‘compression of the diurnal range’ too, for two reasons. One, I wondered what in the model mechanism could cause or inhibit such a behavior. 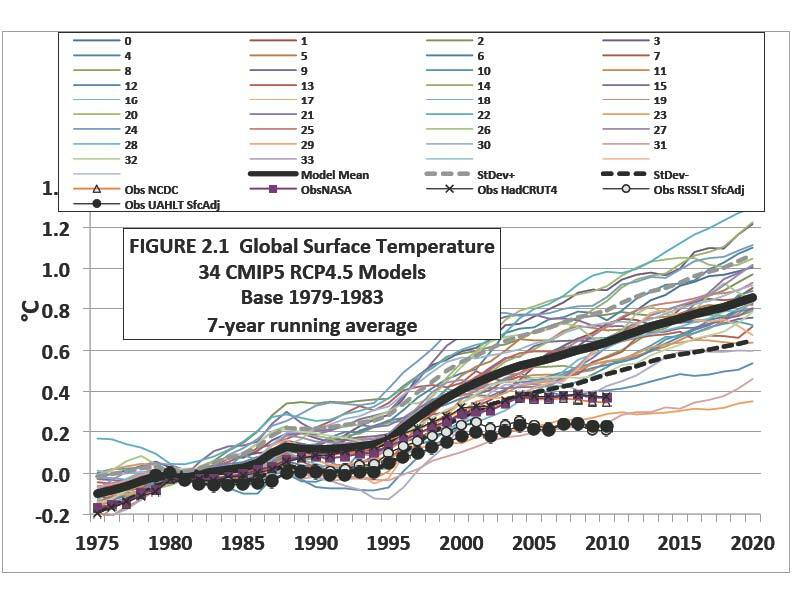 (I’m not a climate scientist, and I don’t know the models.) Two, from a statistical perspective, documenting the behavior of extreme order statistics is tricky, because generally speaking there isn’t a lot of data available to do it with. Also, their statistics tend to be unstable. To nail them, the practice as I understand it is not to try to characterize them as a byproduct of the main distribution, but to understand them on their own. Hence, Castillo, Hadi, Balakrishnan, Sarabia, EXTREME VALUE AND RELATED MODELS WITH APPLICATIONS IN ENGINEERING AND SCIENCE, Wiley, 2005. Example that is good is in Section 11.9.1, “The Yearly Maximum Wind Data”. What in hell is wrong with Pelke? What’s in it for him to play the contrarian? The Surface Stations project was ill-conceived from the very beginning. By its very nature it is based on a misunderstanding not just of climate science, but of the scientific method. Watts would have us believe that you can only do science with perfect error-free data. However, such data so not exist. In reality, scientists spend most of their time trying to understand the errors present in real data. Given that Earth’s surface temperatures are oversampled by about 4x and have long time series, this problem is quite manageable. Those of us who have to work with very sparse data would love to have such a problem. I am on record having said this on this very blog from the inception of Tony’s project. My objection was never to amateurs looking into the issue, but rather to looking into the issue with zero understanding. “It’s a scientist’s duty to be properly skeptical. I still find that much, if not most, of what is attributed to climate change is speculative, exaggerated or just plain wrong. I’ve analyzed some of the most alarmist claims, and my skepticism about them hasn’t changed.” Right. Quite a transition. what is yr take on epidemic of “scare quotes” on issues relating to climate pro and con, skeptics vs believers, AGW, etc, in print and online? Mango #17. You asked a question in #7 that had already been answered in #1. Did you read #1, and the constructive critique at SkepticalScience? The constructive criticism offered in the direction of Watts is much more likely to bury the paper than support it. Pretty generous critique, to be honest! And as others have pointed out, Watts doesn’t exactly have a reputation for accepting constructive critcism. This is the man who said he’s accept Muller’s BEST conclusions, “even if they proved his premise wrong”. This is someone who claims his station analysis results are right and everyone else is wrong, even to the level of suggesting that the people recording the times of observation were writing the wrong times in their logs! This is not, evidently, someone who is amenable to rational explanation or constructive criticism. I think Muller is potentially really important in terms of changing public perception, which is so hugely out of whack with what is actually going on in climate science. I don’t know about everyone else, but I think this is a massive problem, especially for democracies and/or major economies (hello USA, I’m looking at you). It was really interesting to see how former Australian Senator Nick Minchin (and former rabid denier) responded to Muller in the recent ABC Television documentary ‘I Can Change Your Mind About… Climate’, in comparison to how he responded to John E. Barnes, an actual climate scientist. Unfortunately the video’s have expired but the transcripts are still available. I’m not trying to imply that climate scientists are poor communicators, just that converted “sceptics” are probably more compelling to borderline deniers or doubters, who are really important to be talking to. Preaching to the choir won’t get us anywhere. My sincere apologies for mistaking Muller’s words for yours. In my defence, the sentence Watts uses to introduce the quote in question is rather long and not entirely grammatically correct. In my eagerness, I had concluded it was two sentences. Re-reading it now, the sentence is saying that Muller “embraced a practice” during an interview with you, which is something Watts is now following with the pre-release of his grand ‘pre-print draft discussion paper’. Watts quote-attribution remains grammatically ambiguous so it is good that you can confirm it is a quote from Muller. I probably should ‘translate’ Watts contorted text into what I presume he meant to say, but for correctness sake, will stick with the actual words. As my foolishly imagining one sentence as two demonstrates I am not up to the task. Sadly I was only ever taught how to read words that meant what the said. As an example of spoiling the ship for a ha-pence worth of tar, that takes some beating. @30: I agree. Who cares if Muller is still a decade behind? At least now he’s pointed in the right direction. It’s like the wave of conservatives who have recently been trumpeting a carbon tax, as if it’s some brand new, revolutionary idea that no one ever thought of until them. Anything that gets us to debate policy rather than the most basic, settled science is good IMO. @32: Could you (or someone else) please explain how that affects the overall analysis? In Christy’s testimony he presented this graph. Does anybody know why he made a “SfcAdj” to the UAH series? The “overall analysis” in McKibben’s article is that fossil fuel companies already have proven coal and oil and gas reserves sufficient to take the average global temperature well over the 2degC that even the unambitious 2009 Copenhagen Accord recognised should not be exceeded. That conclusion stands, even with the confusion over the figures, since there is no combination of meanings for which that is not true. “2,795 Gigatons … The number describes the amount of carbon dioxide already contained in the proven coal and oil and gas reserves … “, which is not true either (coal etc. doesn’t ‘contain’ CO2). Christy says that the two satellite measurements have been adjusted for an “apples-to-apples” comparison with the surface measurements. I do not know what the adjustedments are, but may be based on climate models which predict tha the troposphere should warm 1.2 times the surface globally. Hmmm. Identity-concealing handle, new as far as I can recall. Thinks AW has a reasonable “point” but doesn’t give any indication what that might be. Thinks we at least owe some constructive criticsm, is promptly pointed to some, then complains truculently that those meanies won’t answer a polite request. The abbreviation sfc for ‘surface‘ often appears in formulae which also use toa so it’s probably Christy’s shorthand for “Surface Adjusted,” him being a satellite man and all. There is an “Amplification factor” used to convert surface temperature changes to troposhhere values. Choosing an appropriate value of this factor was one part of the silliness within the recent Watts ‘pre-print draft discussion paper’ that is discussed at SkepticalScience which explains something of how and where it varies. Alternatively you could rely on NIPCC sources which presumably will require you to dodge all the Ndata and Nsense. SkepticalScience. The link lost its r.
AR4 missed the 2007 Arctic Sea Ice Melt Event. Who wants to guess on what big AGW event will occur between 31 July 2012 and AR5 publication? This delay of publishing would be acceptable if we had a good estimate of how fast global warming was coming at us. We do not. Does not really seem consistent with what is going on with the Arctic sea ice only 3 months later. Compare the loss of Arctic Sea ice volume in 2007 to that of 2012. If one thinks about the geometry, physics, and nature of feedback systems then sea ice until 2040 or 2070 is not plausible. It seems that Hansen has it correct once again: “The future is now. And it is hot.” Everything else in climate science seems to be papers submitted a year ago based on 2 year old data. That approach works in Medievial French Literature, but it does not work in Climate Science when the future is now. It might be getting into the weeds a bit, but creating a globally homogenized temperature series using that many stations is actually quite an important result, since homogenization methods like the PHA don’t do that well in areas and times with sparse spatial coverage. It provides more evidence that there are not large uncorrected inhomogenities lurking in GHCN-Monthly.